I was in Singapore about two months prior to this trip in November 2011, and I was so busy with eating with my friend Karlson at the time, I never made it to McDonald's to see what they had. I checked the website prior to visiting as always, and I didn't see any limited edition items, so I never bothered to enter and look. 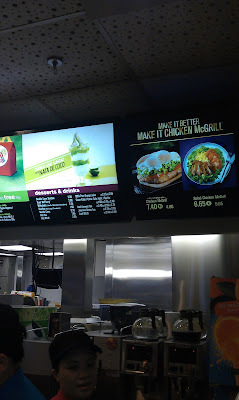 But this trip was different, as I had started writing this blog by then, and not seeing anything special on the website for the second trip in a row, I thought at least I could sample a McCafe item as a last resort. But thankfully, when I entered, I found at least 2 dessert items that were on promotion. The first being the 'Coffee Oreo McFlurry' (sorry about the blurry photo, I've since purchased a new camera), which was only available at the separate dessert kiosk and a part of McDonald's 'a cuppa Chillin' promotion. 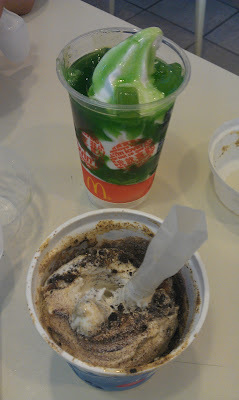 This limited edition made the McFlurry 20 Singapore cents more expensive then a standard flavours, but it was still cheap at $2.20SGD. 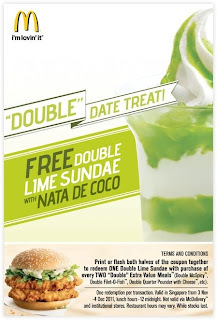 The second dessert item, strangely, wasn't being offered at the dessert kiosk, but only inside the store, and it was a 'Double Lime Sundae with Nata De Coco', which at the time I had no idea what that was supposed to be. I queued up for the McFlurry, while my friend Karlson waited for the Sundae. 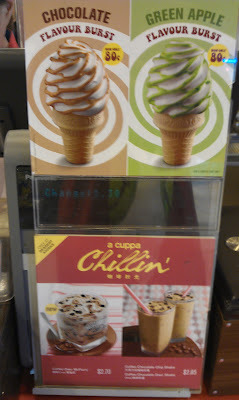 They also had what seemed to be two special 'Flavour Burst' ice cream cones, that had either Apple or Chocolate syrup spread around it, and Coffee Oreo Milk Shakes, but two orders of ice cream was enough for one day. They were also offering a promotion where if you ordered two double burgers (McSpicy, Filet-o-fish or Quarter Pounder) you would get the sundae for free, see the promotional photo above. The sundae, had a frighteningly green colour too it, and had probably 3X the amount of syrup that one would expect on a McDonald's sundae, the photo I took doesn't do it justice with the amount of syrup, it was probably a 1:1 syrup to ice cream ratio. The 'Nata De Coco' was coconut jelly, and it often found in Taiwanese bubble tea. They added surprisingly large chunks to the sundae, and the subtle coconut flavouring was a nice contrast to the slightly sour lime syrup. You can read more about the Nata De Coco, from its Wikipedia article - here. 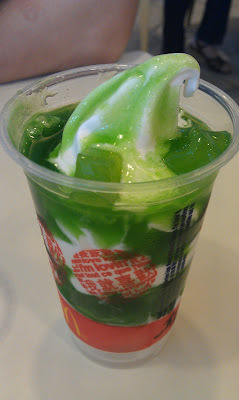 When I Googled this item to find the promotional photos for my blog, alot of other Singapore-based food bloggers have praised it, calling the lime syrup addictive. I really hope it becomes a standard item, as I want to try it again. 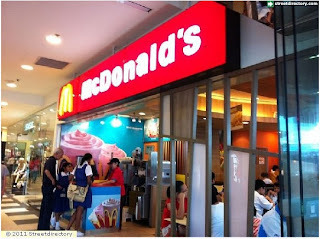 Cool blog, didnt know there was that much of a difference on food offerings at different locations. Can't wait for more food posts! Don't worry, I still have a lot of older items to post. Where did you find the blog? this is such a cool blog! It is very informative as well as interesting and fun, especially for someone like myself who will doesn't have the opportunity to travel to these places! I live in Las Vegas and Im not a big fan of Micky Dee's, but I love the different offerings that are specific to the region it located in. Awesome JOB!!!! Keep up the good work! I found you in the reference section of wikipedia by the way!